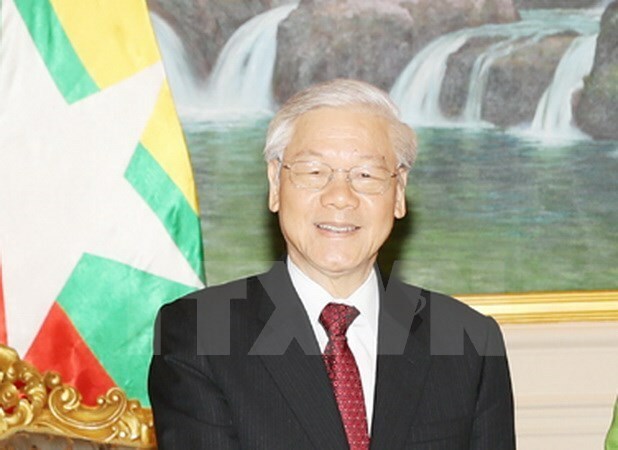 Yangon (VNA) – The Vietnamese Party and Government always attach importance to developing and expanding the friendship and multi-faceted cooperation with Myanmar in bilateral aspects as well as within ASEAN and at international forums, Party General Secretary Nguyen Phu Trong has said. Meeting with leaders of Myanmar’s ruling National League for Democracy (NLD) in Yangon on August 25, the Vietnamese leader spoke highly of the NLD’s important role and active contributions to the country’s recent achievements. Party leader Trong, who is on a State visit to Myanmar, wished the NLD will continue to obtain more successes in promoting national reconciliation, developing the economy, and raising the country’s stature in the region and the world. He expressed his delight at the development of the two countries’ cooperation and traditional friendship in recent years, especially since Myanmar entered a new stage of development. He underlined the Vietnamese and Myanmar leaders’ agreement on setting up a comprehensive cooperative partnership between the two countries. Accordingly, their ruling parties need to enhance cooperation and experience sharing for the sake of each nation’s development, their people’s interests, along with peace, stability, cooperation and development in the region and the world. On behalf of the NLD leaders, Secretary of the NLD Central Executive Committee Nyan Win stressed the significance of his guest’s visit to Myanmar, which he described as a support to the comprehensive national reform which the NLD-cored Government of Myanmar is pushing for. He highly valued the huge and historic achievements that the Vietnamese Party, State and people have attained over the three decades of reform, considering them precious experience for the NLD and the Myanmar Government.